Vittorio De Sica’s story of a father and son searching for a stolen bicycle on the streets of Rome is a classic of post-war Italian cinema. Vittorio De Sica’s story of a father and son searching for a stolen bicycle on the streets of Rome is a classic of post-war Italian cinema. Heralded as the greatest film ever made on release, winning an Oscar in 1949 and topping the Sight & Sound film poll in 1952, De Sica s seminal work of Italian neorealism has had an impact on cinema worldwide from release to the present day, with filmmakers such as Satyajit Ray and Ken Loach claiming the film as a direct influence on their own. 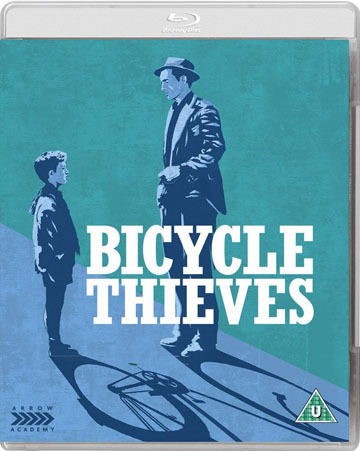 Bicycle Thieves tells the story of Antonio, a long unemployed man who finally finds employment putting up cinema posters for which he needs a bicycle. His wife pawns all the family linen to redeem the already pawned bicycle and for Antonio salvation has come, until the bicycle is stolen. Antonio and his son take to the streets in a desperate search to find the bicycle. Bicycle Thieves is as much about the position of Italians in post-War, post-Fascist Italy as the relationship between father and son, told through the labyrinth of the cinematic city with De Sica s arresting visual poetry. Defining neorealism, a small period of filmmaking that focused on simple, humanist stories, Bicycle Thieves was one of the most captivating and moving.